Kia: Feel Something Again featuring Steven Tyler – 2018 Super Bowl 52 Maybe the best Super Bowl 52 ad! Kia launches the “Fueled by Youth, A State of Mind” Stinger marketing campaign with a 60-second ad entitled “Feel Something Again” scheduled to air during the third quarter of Super Bowl LII. 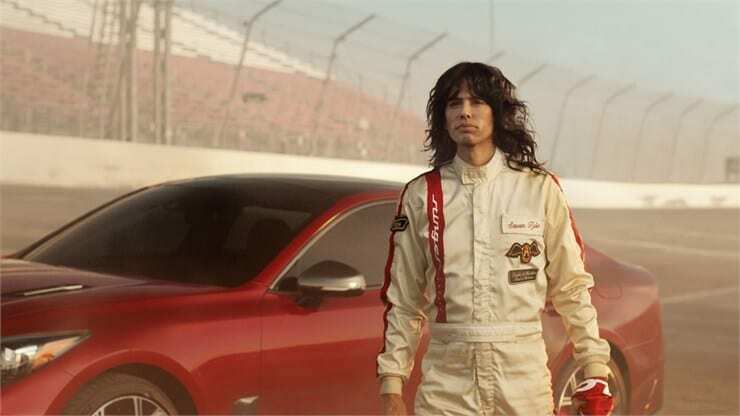 Created by the advertising agency David & Goliath, Kia’s commercial features Aerosmith’s Steven Tyler featured two years ago in the Skittles’ 2016 Super Bowl 50. Here you can watch the Kia 2018 Super Bowl and the reverse version (maybe you catch the hidden message in the 2018 Kia Stinger big game ad). Featuring Steven Tyler behind the wheel, turning back the hands of time is as easy as pressing the start button in the all-new 2018 Stinger in Kia Motors’ Super Bowl ad for the highest performing and most anticipated model in the company’s history. As the haunting notes of “Dream On” play backward, two-time Formula One and Indianapolis 500 champion Emerson Fittipaldi looks on approvingly as Tyler approaches a Kia Stinger on an abandoned racetrack. Once inside, the Stinger GT’s twin-turbo, 365-horsepower engine is put to use – in reverse – sending Tyler on a transformative journey back to the seventies. Working in close collaboration with Tyler, state-of-the-art video and CGI work helped bring the music industry icon’s 25-year-old persona to life on the screen to stunning effect. The all-new 2018 Kia Stinger GT’s twin-turbo, 365-horsepower engine is put to use – in reverse – sending Steven Tyler on a transformative journey back to the seventies. Designed in Frankfurt and developed on Germany’s famed Nürburgring under the watchful eyes of two auto industry legends – Peter Schreyer, Kia Motors’ president and chief design officer, and Albert Biermann, head of Vehicle Test and High-Performance Development – the Stinger is unlike anything seen before from the brand. 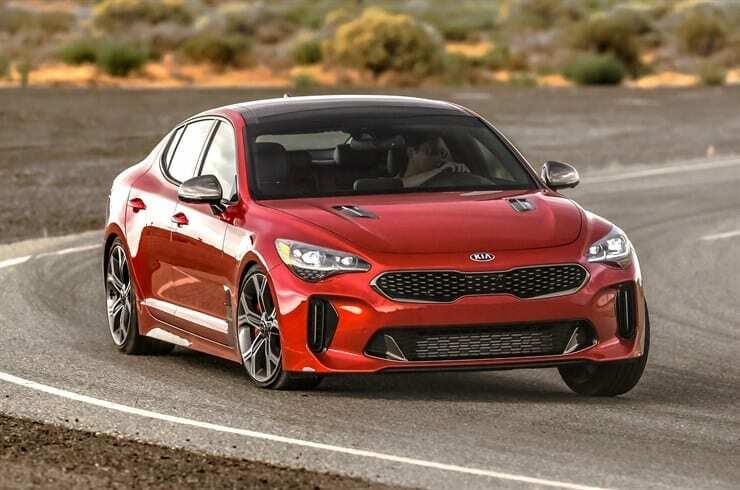 The Stinger GT, with its twin-turbo V6, pushes the sports sedan to a top speed of 167 miles per hour and from zero to 60 miles per hour in 4.7 seconds. 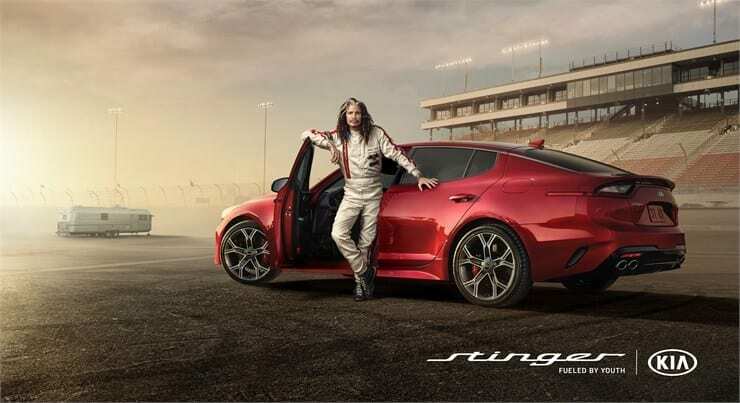 Steven Tyler hits the racetrack in Kia’s Super Bowl ad for the all-new Stinger sportback sedan.